Teaching Music History? How do you inspire students in your Music History Lesson Plans about Great Composers such as JS Bach, Mozart, Vivaldi and Tchaikovsky? Simple… Start with the Juicy Bits! When we started to write this module we had to find a way to get children to relate to composers that lived 300 years ago. We live in a fast paced world, where many students of today haven’t even used CD’s, let alone records or tapes! How do they relate to a world where there wasn’t even that? There was no way of recording music in Mozart’s time other than a pen and a sheet of paper! “Do you know which composer had his body dug up by two well respected scientists and his head removed in 1809 to see if genius was related to head size”? “Do you know which composer was once arrested for tampering with the American National anthem”? “Do you know which composer has a recording of his music floating in outer space”? 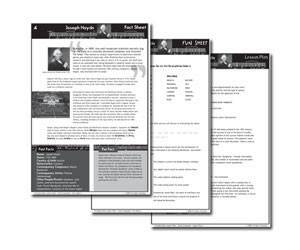 By starting our fact sheets with interesting facts, and including “fun facts” about each composer we have hopefully made the subject a little more accessible to the students of today. 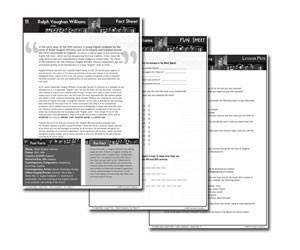 In order to do this massive undertaking we started with a short list of 50 writers who wanted to contribute, then we chose just five to create one lesson for us, and finally we chose one very talented writer to bring it all together. We then let her take her time to create the fact and fun sheets – in fact this project has been in development for almost a year! Choosing fifteen composers to profile in this project was a difficult task, but we chose them to represent a cross section of eras and musical styles from Baroque through to the 20th Century. 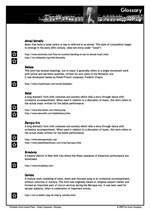 You can of course use these lessons in any order, or pick and choose ones that suit your classes. JS Bach starts our journey into the great composers. 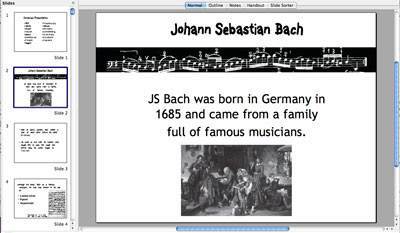 Students can design a facebook profile for Bach, and explore different interpretations of his music, from the original Organ and Harpsichord versions through to rock renditions. In this lesson students will think about living in Venice in Vivaldi’s time: what it would have been like to travel around the city via gondola or boat in its canals. The’ll also learn about what it would have been like for Vivaldi as a priest, working in an orphanage, composing music and teaching violin. In this lesson students will discover what it was like to work as a professional musician in the 18th century, as they pretend to be Prince Esterhazy and have to write a job ad for a new musical director. Students can discuss what it would have been like to work in the one job as a composer for 30 years, and then what it would have been like to have his music released to a wider public at the end of his tenure. In this lesson students will imagine that they are conducting a guided tour of the Mozart Museum in Austria, and that they have to present a talk about Mozart and his life. They can also explore mozart’s variations on “twinkle twinkle little star” as a simple analysis exercise. This lesson gives students the opportunity to explore what it would have been like to be deaf and compose such beautiful music. Students can explore feeling vibrations in instruments, as well as viewing videos and researching others who have conquered disabilities in their careers. 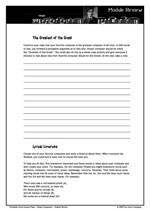 This lesson gives students in high school the opportunity for a great discussion. Wagner was excessively nationalistic, almost to the point of being racist and hostile towards Jewish people. Wagner was the personal hero of Adolph Hitler, and his music was played on loud speakers as thousands of jews were led to the gas chambers. How should this affect our appreciation of Wagner’s music? Should famous pieces such as Ride of the Valkyries and Lohegrin: Bridal Chorus still be so popular today? Should we not perform them infront of Jewish people? 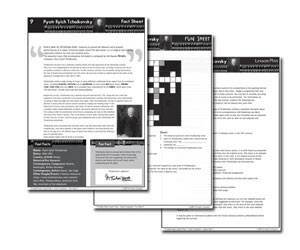 In this lesson students will design a programme for one of Tchaikovsky’s concerts, plus explore the impact of his relationship with the wealthy Nadezha von Meck. Tchaikovky’s music is particularly suitable as students can explore program music by listening to the 1812 Overture and exploring its historical background. This lesson gives students the chance to explore expressionism and links to visual art and historical events of the time. Students can discuss the impact that world music had on the music, plus explore the romantic style of this excentric composer. In this lesson students can explore folk music and its place in classical music. What is folk music? Why were folk songs written? Why do we still know folk songs today? Students can also explore the poem “The Lark Ascending” in conjunction with Vaughan Williams’ piece. In learning about one of the most controversial composers to ever put a pencil to music paper, students will have a chance to explore 12 tone or serial music and discuss tonality vs atonality. Love him or hate him, the contrast that this composer provides will certainly open students minds to different forms of expression in music. What a scandal! Students will learn about the effect that the premiere of “The Rite of Spring” had on a conservative ballet crowd in Russia. This is one of the defining moments in music history, and gives students a chance to discuss 20th Century classical music and what it means today. Gershwin’s music is an ideal vehicle to discuss links between Classical and Jazz music. This earned Gershwin a unique place in music history as a link between classical, Jazz and broadway music. 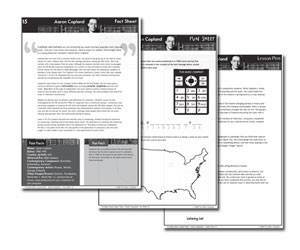 The uniquely American composer Aaron Copland finishes off the module. Learning about cowboys and outlaws and what they are doing in a ballet! Plus explore the place that classical music has in modern life: for example in movies and television commercials. 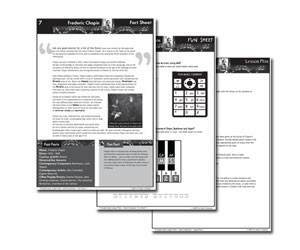 Students can even create their own movie or powerpoint presentation to go along with Copland’s evocative music. 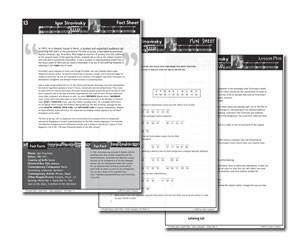 Every fact sheet in the series has two available versions – one with selected important words in highlighted text, and one with selected important words left as an answer blank. 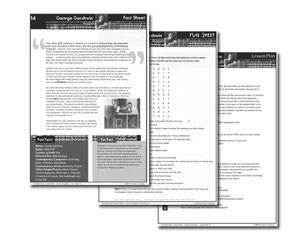 In the class you can fill in the answer blanks – helping students to retain the important information as you go through the content as a class. 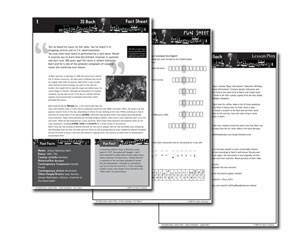 This module, along with every module in the Printable Music Lesson Plans series includes prepared powerpoint presentations. 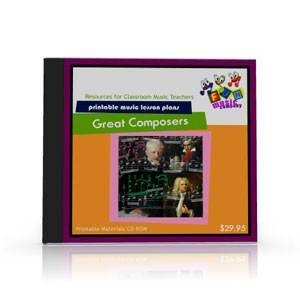 With a module such as this where students will be learning about music from the great composers it is necessary to find recordings of the music to play to the students. 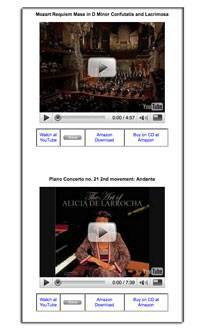 Because of copyright we obviously can’t supply you with recordings of the music, however we can make it easy for you to access exisiting available resources on the internet. 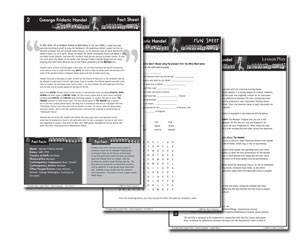 If you’re teaching about music history one thing you will need is a completion assessment or final test or exam. 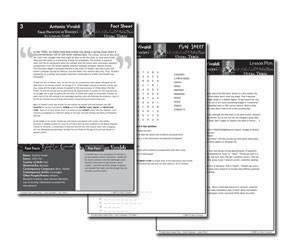 Each lesson contains the fact sheets plus worksheets, plus lesson planning ideas – you can take the lessons as slow or fast as you wish, and choose lesson ideas to include or not. 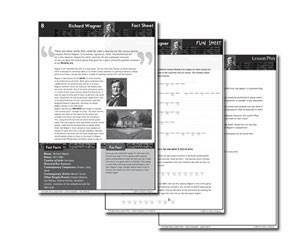 You could easily stretch out the material over two or three lessons per composer if you wished. 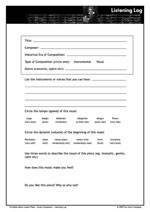 This is designed for Junior high school level (Ages 12-14), but it can easily be adapted to suit other age groups. 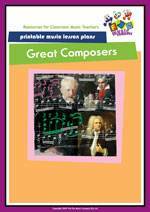 This could even be used in an adult music appreciation class to learn about each of the composers. Do students need any prior knowledge? 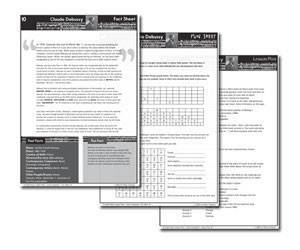 You can print out each lesson one at a time if you wish, or we also have the student workbook ready to print for all 15 lessons. Just print out and bind them up and away you go! 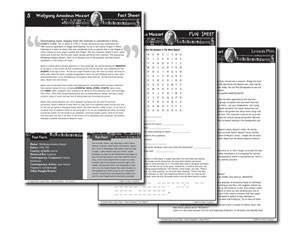 Printable Music Lesson Plans Modules are $39.95 USD per module. 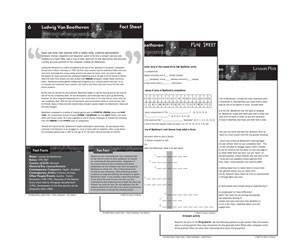 This includes all 15 lessons, all the printable bonuses and powerpoint presentations. We will let you know the legal stuff of course, but the long and the short of it is that you have the right to print out as much as you need for your teaching. The only restriction is that you can’t re-sell or share the license with anyone else. It’s just common sense really!